kasthamandap- Heart of Kathmandu city! A moment of silence! 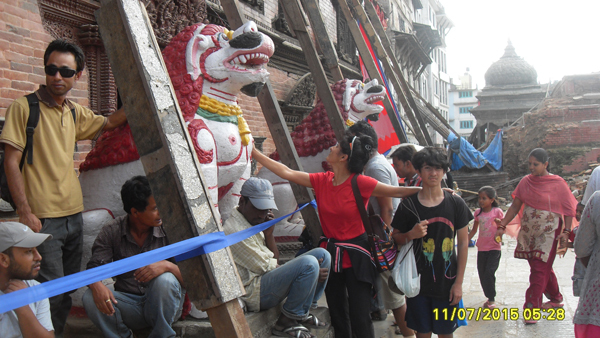 – ArunasNepalRelief, Inc.
Kasthamandap (Sanskrit), Literally “Wodd-Covered Shelter”) was a three-storied temple situated at Maru, Kathmandu. It was one of the largest and most noted pagodas of Nepal. The temple is built in pagoda style design. It was built in the early sixteenth century by King Laxmi Narsingha Malla. The whole temple is built from just wood of a single tree, and covered with the shrine. It is believed that it was made by artist named Biset. The name of capital city is named after this temple. Once a year a huge ceremony is performed in the temple. On that day people gather around the temple and they stay up all night. People share the legendary stories about the temple and enjoy different variety of food. The temple is one of the major tourist attractions as well. Everyone is allowed to visit the temple, but people are prohibited to take photographs when inside. The temple is open after mid day until midnight. The unique feature of Kasthamandap has made it the most noted pagoda of Nepal. 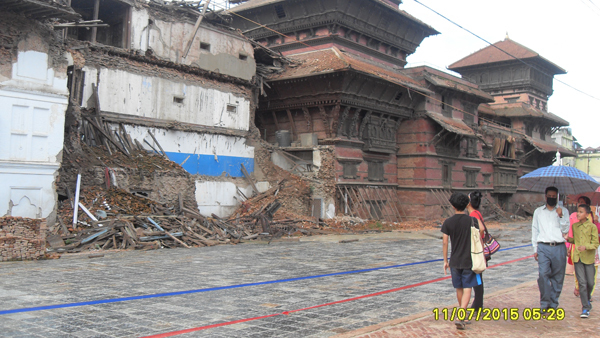 The earthquake on 25th April 2015 caused severe damage to this temple and its ultimate collapse. Mythology It is believed that Gorakhnath, a disciple of Machhindranath (Nepal Bhasa: Janamaadya) visited Nepal during a chariot procession of Machhindranath morphing as a normal human. 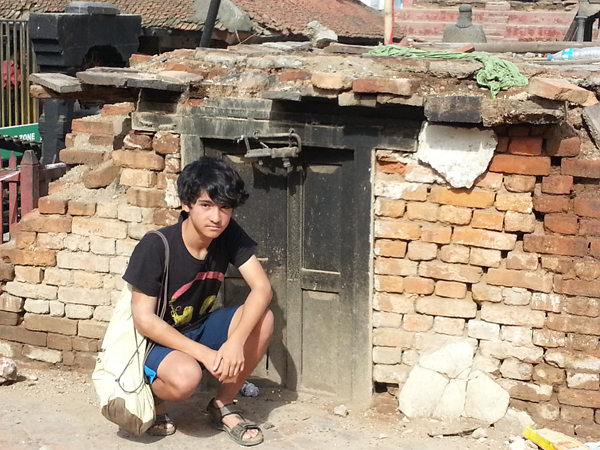 A tantrik spotted him and trapped him under a spell rendering him from leaving Kathmandu. Upon knowing that he is trapped, Gorakhnath asked the tantrik to make a wish so as to allow him to be freed from the spell. The tantrik asked for materials enough to make a temple. The very next season, a giant tree grew in the farm of the tantrik. Using this single tree, the tantrik constructed the temple of Kasthamandap.It is also believed that the term Kathmandu arises from Kasthamandap. Sitting in silence, 3 generations, mom & son and grandma. 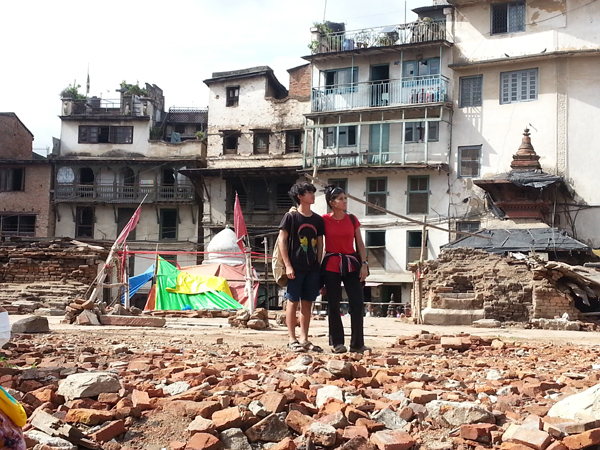 Just watching where once stood Kasthamandap in its glory and now nothing but rubble. We just took it in barely speaking, just watching in silence. This is the heart of where I was born! July, 7th, 2015, after completion of some of our short term relief efforts, we finally get to venture off to the heart of Kathmandu, Nepal! 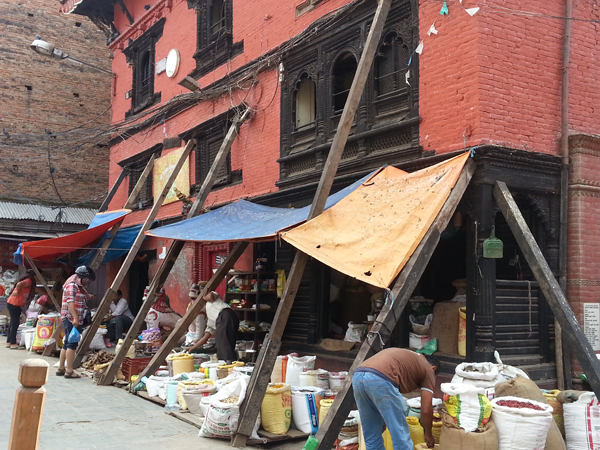 Keep in mind, there are places throughout Nepal that are 100% intact and places that are completely devastated! Would I travel to Nepal again? In a heartbeat! There is much to do, bask in the glory of the Majestic Himalayas, trekking, hiking, river rafting, paragliding, safari, mountain biking….you name it! Tourism has taken a big hit and one of the best ways you can donate is by visiting this beautiful country. I was just there. As long as you prepare and take precautionary measures, just like travelling to any country, I say it is safe to go visit and enjoy! There is more than one way you can donate! You can visit! 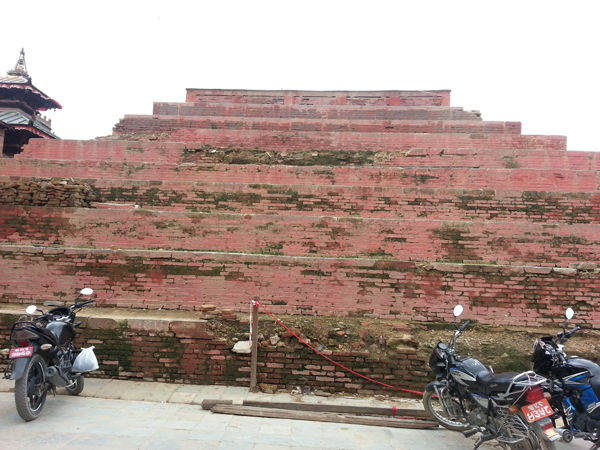 Shock and awe at the devastating site of where once stood all the temples and Kasthamandav in all its glory. But, Nepal and its people are resilient and will rise! My prayers and heart will always be with them! 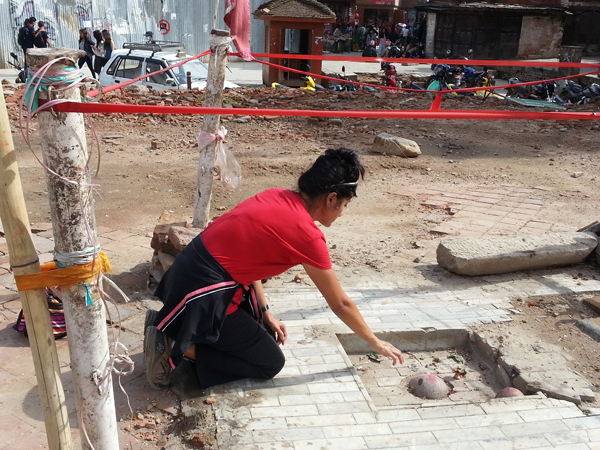 Touching the very heart of Kasthamandap and offering prayers! 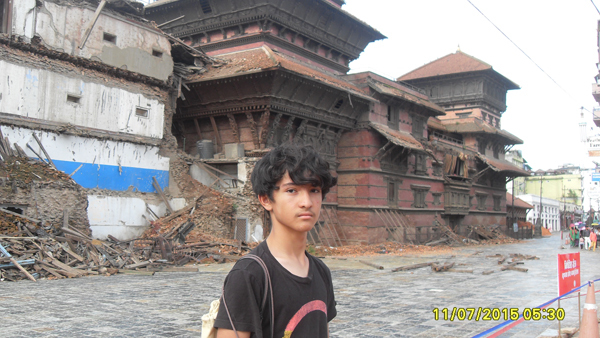 13 year old son feeling the sights and sounds of the devastation of Nepal earthquake. Shock and awe, so much devastation in “places” to a country that is so beautiful! A trip he will never forget in his life! So much to soak in and a feeling of gratitude and a feeling of a new level of strength after seeing how Nepali people have risen despite what they have endured! Experiencing it all, the good, the bad the ugly which exists in every society of this world. There is a silver lining in every dark cloud. We chose to take in all the negatives and turn it into a positive because above all we learned so much from this trip. The memories are everlasting and we will be back again soon! 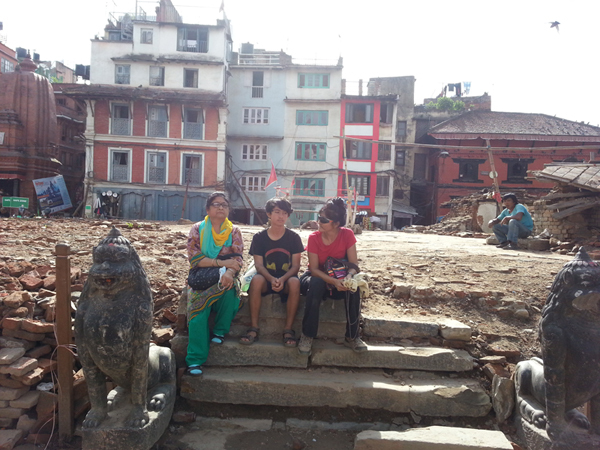 What is left of where a temple stood! Much devastation to the surrounding of the heart of the city Kathmandu, Nepal. 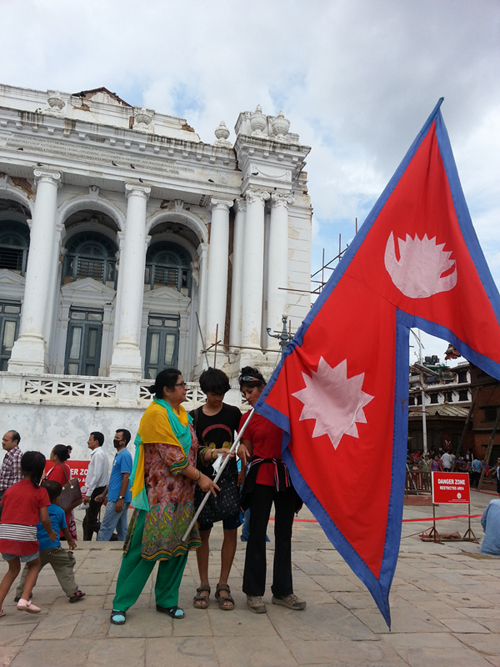 Coincidentally, there was a guy letting people hold the giant Nepali flag and we did not miss this opportunity. A moment of pride! They have endured a lot, yet amidst all the chaos, they have cleaned up, found a way to rise and go about their business. 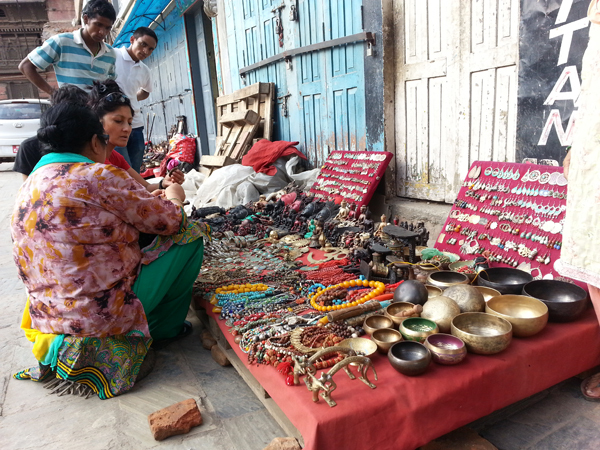 Coming here, buying relief materials and ordering school supplies straight from Kathmandu factories and also doing a little shopping puts money into the Nepalese economy. It puts money directly into the hands of the people. It feeds and helps support many families who have taken the initiative to rise, smile, wake up everyday and find a profound level of normalcy in their own way. I salute them! 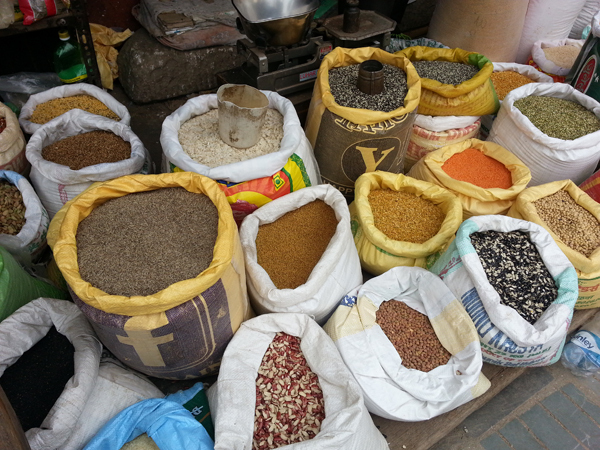 Spice market amongst the ruins of the 2015 Nepal earthquake devastation. Bitter/sweet but we buy what we can get our hands on! 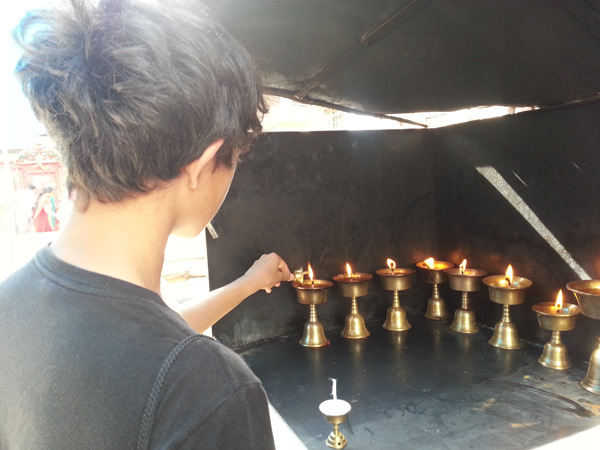 Offering prayers and lighting diyas as we went through the city. Learning about where he came from, learning from mom and grandma, going back straight to his roots. Soaking it all in, the culture, the sights and sounds and smell and a feeling of pride he has always had to be a part of Nepal! The market place surrounding Kasthamandab. You almost want to buy everything and bring it back. We shopped a little and brought home some momentos. You buy, you support a family to feed their family. You put money into the Nepalese economy. The tourism industry has taken a big hit. The places we visited used to be full of tourists hustling and bustling. It does not feel unsafe, I would go again! 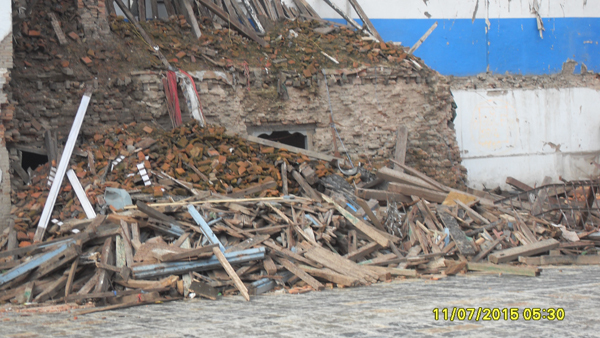 It is a sad sad sight but in my heart Nepal will rise again, stronger than ever! One momento I had to bring back home! 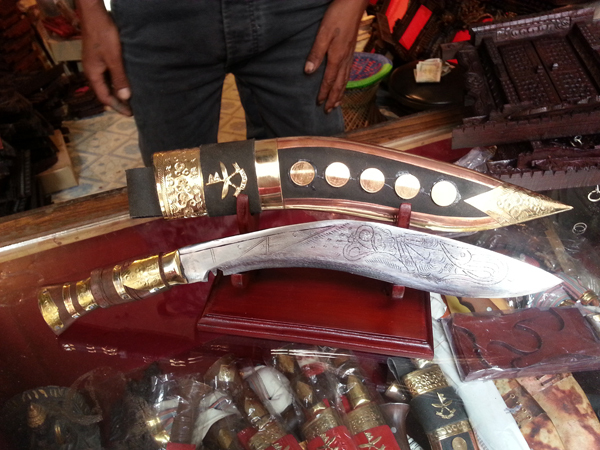 The Nepali Khukuri that the brave Gurkha’s carry! It may or may not be the real deal but I am content just to share the story with my family with pride! Naturally warlike and aggressive in battle; to possess qualities of courage, loyalty, self-sufficiency, physical strength, resilience, orderliness; to be able to work hard for long periods of time; and to fight with tenacity and military strength. Falling in love with Nepal is very easy to do!